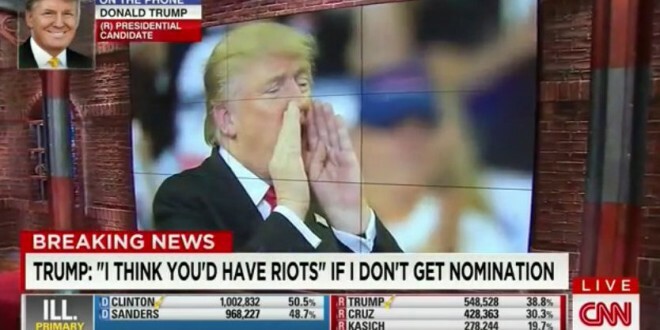 Trump Predicts Riots If He Doesn't Get Nomination - Joe.My.God. Donald Trump on Wednesday sounded like a man ready to take the stage as the Republican Party’s nominee by acclamation at Quicken Loans Arena in Cleveland come mid-July, delegate math and a debate scheduled for Monday be damned. Denying him the GOP nomination as part of a contested convention, he declared, would “disenfranchise” the millions of people he is bringing into the party and could spark riots. The only problem: Delegate math. Trump, who flooded the morning television shows with a deluge of off-camera telephone calls after a night of big wins that knocked Florida Sen. Marco Rubio out of the race, said that even if he doesn’t amass a majority of delegates by July, the party should unite behind him anyway. But Trump has a ways to go when it comes to getting to the magic number of 1,237. “Now, if you disenfranchise those people and you say, well I’m sorry but you’re 100 votes short, even though the next one is 500 votes short, I think you would have problems like you’ve never seen before. I think bad things would happen, I really do. I believe that. I wouldn’t lead it but I think bad things would happen,” he said.